There are certain beauty products in my collection that are reserved mostly for the summer, and I discover new ones each year that I enjoy. 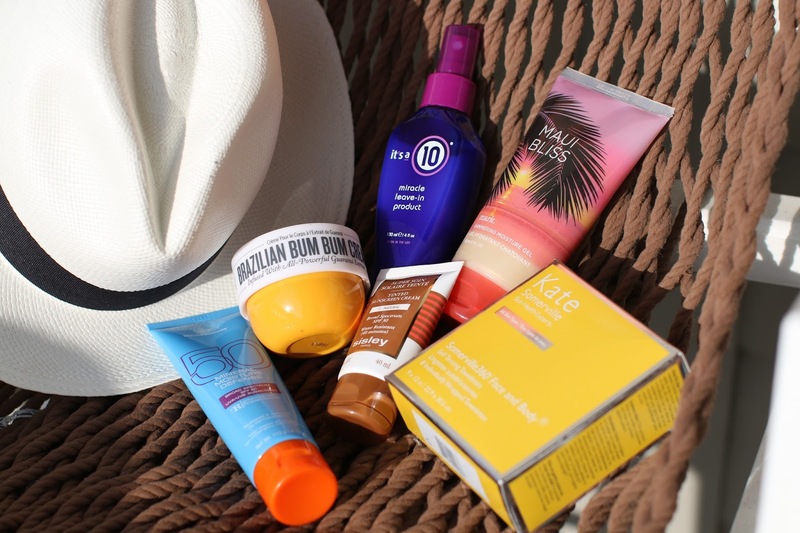 This year I found a few new products that really impressed me for the summer, and one repeat from summers past that has stayed a permanent fixture in my routine. 1. It's a 10 Miracle Leave-In Product - This may not be an exclusively summer only hair product, but my hair does need all the help it can get in the warmer months. I heard nothing but great feedback from readers about this hair treatment and how it truly transformed their hair. I spray it in my hair when damp after the shower and then comb it through and style as usual. It does almost anything and everything you can imagine from detangling to fighting frizz and helping prevent split ends. I've been using it on my hair for the past month and what a difference it has made! My hair looks healthier, shinier and I swear it has grown more in the past 30 days than it has over the past 6 months. It's a great product for any hair type to add into their routine to help with overall hair health. 2. Kate Somerville 360 Face and Body Tanning Towelettes - These are a repeat from summers past and a self tanning product I really enjoy. It gives a bit darker pay-off than my favorite self tanner of all time, so I have to be a bit more cautious when applying and ensure I have exfoliated to the fullest! I like using them specifically on my legs and arms because it deepens into a gorgeous golden color that looks very natural. *golden for me is probably pale for everyone else, but I felt like a bronze goddess! * I have many friends of all different skin tones that also use these because they help to add a hint of color and also even out skin tone. And they are portable - bonus! 3. Sol de Janeiro Brazilian Bum Bum Cream - I was not sure what the heck this cream was and it sounded a bit silly to be honest. Then I read some rave reviews about it so I had to bring it with me on my recent beach trip. First things first - it smells amazing and is great to use just for the scent! I would use it on my legs and stomach before heading to the beach under my sunscreen and found that it did help to make things look a bit more smooth and firm. In years prior, I have used this cellulite serum and loved it! I found that it is one of the best on the market and did make a significant difference on the appearance of my legs when using every day. Of course when I stopped using, the results disappeared but it was a great addition to my summer skin routine. 4. 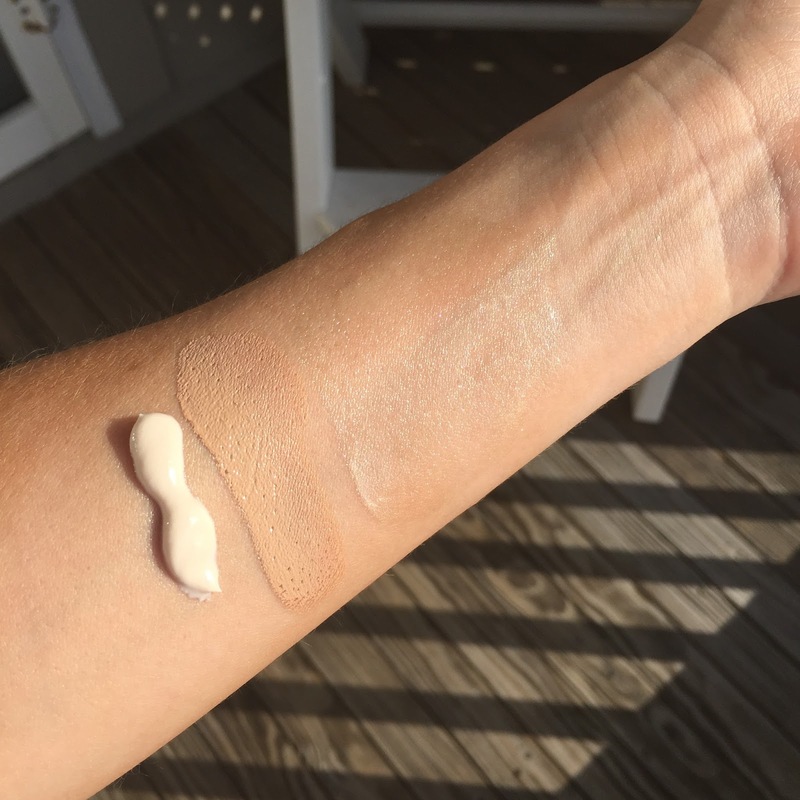 Sisley Tinted Sunscreen Cream - Though it is hot and humid in the summer and wearing foundation feels like the last thing I want to do, I still like to have some coverage on my face. Especially when I am at the beach. This tinted sunscreen from Sisley is one of the best formulas I have tried in a long time and was amazed at how much it covers as well as how matte it leaves my skin. I can apply it quickly with my fingers or even with a foundation brush for an actual makeup look. I love that it combines sunscreen and makeup in one! Come wintertime, I think this will unfortunately be too dark for me and I will have to keep it as a summer only product. 5. mark. Maui Bliss Shimmer Moisture Gel - I know there are a ton of shimmer oils and lotions for the body that launch every year and to be honest - none of them ever appeal to me. I have pale skin and most of the shimmer body products look best on those with deeper and more tan skin tones. Plus they can feel like makeup to me and I am always afraid of it getting on my clothes. That all changed when I tried this Shimmer Moisture Gel from .mark. It's a very pale shimmer that works better with my skin, and actually moisturizes my legs in addition to adding a bit of shine. The reflective particles are so subtle and blend nicely into the skin that I didn't find any transfer to my clothing. Plus it smells like a fruity tropical drink which makes it even better to use! 6. MDSolarSciences Mineral Moisture Defense SPF 50 - I didn't think I would find anything I loved as much as my holy grail body sunscreen, but I have! This one has a slight tint to it which I enjoy because it doesn't look as pasty as some other body sunscreens, and it feels more like a moisturizer than a typical SPF. That is the one issue I have continuously with SPFs for the body - the texture can feel like a sticky mess and I can't wait to wash it off. However with this formulation from MDSolarSciences, I kept applying it throughout the day and never felt uncomfortable or suffocated by the texture. And not a single inch of my body got burned which even when I am under an umbrella for most of the day still happens to me! I can get burned from just walking around for a few minutes, so it's essential I find a sunscreen to help prevent that for me when at the beach. I have loved this so much that when I arrived back home from the beach, I have been applying it every day to my legs and arms before running errands because the texture feels like a moisturizer but it still gives me the sun protection I need.